What Does It Mean to Be a User Interface Developer? Let’s imagine that you have an idea for a startup. You have conceived an application of a very-important-for-you-sphere, which will help people do very-important-human-things. Back-end developers will help you with the technical component of the project. However, you need to make a candy. The product needs to be wrapped in a beautiful package. So, who’re you gonna call? A user interface developer! The main task of user interface development is to transfer information and commands between us, people, and the software components of various computer systems. Many small and huge software enterprises build various applications for mobile and stationary devices, and spend a lot of resources on providing a pleasant and intuitive interface. The companies are trying to make a product understandable and attractive to a user. In other words, everybody prefers understandable interface—nobody will try to understand some application if there is no special need. A UI developer’s job is to make our life easier. 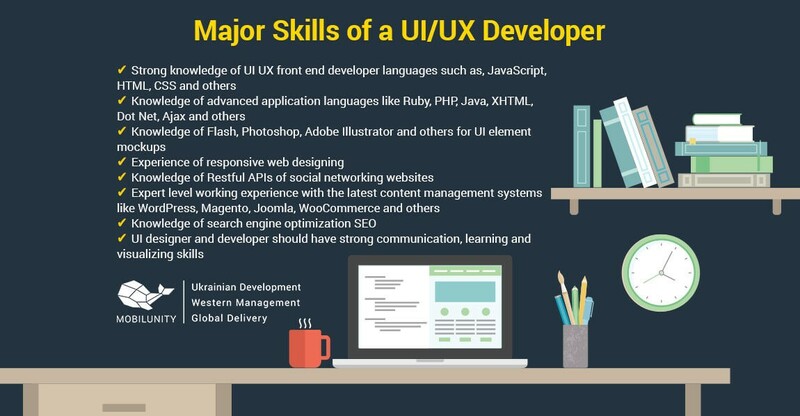 Let’s go ahead and take a look at what employers are looking for when they need to hire a UI developer. Sometimes you have to pity the developer. Every novice user interface developer faces some kind of standard and requirements. Just imagine, a developer was going to become a UI designer, to reveal to the world his talents, and then he is forced to follow requirements he wasn’t aware of. I think you’ll agree, the interface should be simple and intuitive, especially if the application is not aimed at professional users. Also, the requirements should include the external attractiveness of the product, the location of objects on the screen and an understanding of what the user thinks about the application. Expectations are important. The developer needs to take into account the importance of user experience. As a consequence, there is a need for collaboration with user experience developers. There is a great variety of tools for the user interface developer. But, of course, the most popular is Adobe Photoshop. Many UI designers of older generations already seem to have spent all their lives with this app. The Photoshop product will be a good solution for beginners, as there are a lot of forums and manuals. However, there are drawbacks. Initially, Photoshop was conceived as an application for photographers. Later, developers began to add everything that came to mind. This application has turned into a sluggish elephant. And if you need to use Adobe Illustrator at the same time, then it’s better to stock up with modern hard software in advance. There is also Sketch. Recently, the application had a bad reputation because of buggy earlier versions. However, the new version of the program attracted its audience, including me. Sketch is very optimized. Several application screens can be used in one working document. It is accessible for editing without superfluous actions and no loss in productivity. In addition, it has a very thoughtful interface, and is not as cumbersome as Photoshop. There are many other UI tools, with various advantages and disadvantages. You choose. If you don’t struggle to improve user experience, forget about this job. Otherwise, you must understand the theory of painting. That is, what colors can be used with each other, and which combination is forbidden. It is also important to understand what techniques are better to choose to cause specific emotions, depending on what is the goal of the product you are working on. The most important task for you as the UI developer is to create a candy. Even an acceptable, attractive, and nice visual look of applications would be enough. The use of the right design solutions for the application is one of the most important criteria for attracting customers. More customers bring more profit to your product and to you. Many people evaluate the book by its cover. So, you’d better try harder. Like many IT development areas, the UI dev should focus on user experience tips. Try to put on the user’s shoes. Have a good understanding of how the application is used by a person who does not need to know the technical part of the program. A UI developer should provide easy and pleasant communication of the user with the program through the appropriate interface. I took the information from two internet resources, which are located in the U.S. The data from Glassdoor for December 2017, and the data from PayScale for April 2018 is slightly different. 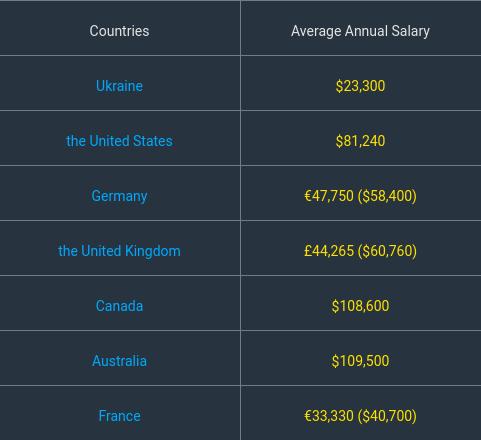 However, the average score from both sites shows that the average UI developer salary is approximately $80,000 per year for the U.S. Of course, the salary rate in other countries is different. To be a user interface developer is an awesome career. You are taking part in the creation of a product that will cooperate directly with the end user. My article is generalized but you can always find training manuals and educational videos on how to become a UI developer. I would like to remind you again that UI development requires good understanding of the interaction of a person with software. And remember, may the UI force be with you.